In April a total of 38,234 individuals were apprehended between ports of entry on our Southwest Border, compared with 37,383 in March, according to U.S. Customs and Border Protection. This chart includes apprehensions and inadmissibles. The U.S. Department of Homeland Security said recently released border migration numbers “underscore” the continuing “security crisis” on the Southwest border. Customs and Border Protection officials released Southwest Border Migration numbers for the month of April, citing an 8-percent increase of “illegal border crossers,” or a total of 851 more crossers from March to April of this year. This year’s April numbers are more than triple those from April 2017, when there were 11,127 apprehensions — with a significant decrease during the months following President Donald Trump’s inauguration. The apprehensions in April 2017, however, were the lowest reported in fiscal year 2017, according to the CBP website. April 2018 apprehensions closely resemble that of April 2016, when 38,089 apprehensions were reported. In April 2015, CBP made 29,750 apprehensions. 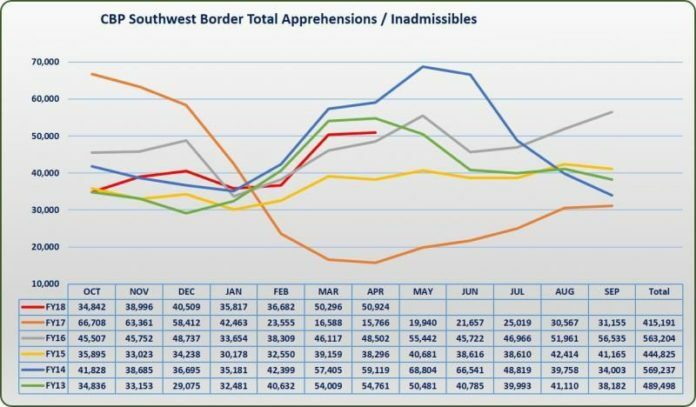 According to CBP statistics in FY 2014, CBP reported 51,502 apprehensions in April, which was during the surge in unaccompanied minors and family units migrating into the United States from Southern and Central American countries. In a news release, DHS cited the recent announcement to add 35 new prosecutors to federal court districts along the Southwest Border, and 18 supervisory immigration judges to 10 immigration courts, as steps the agency is taking to help with the prosecution of cases related to illegal crossings. 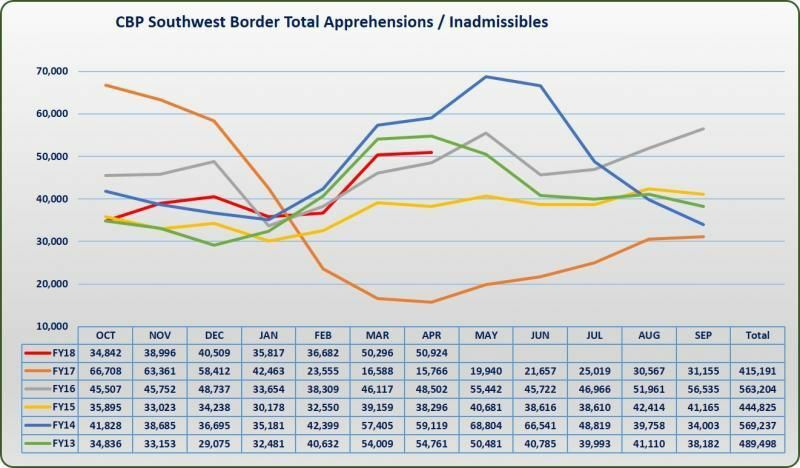 Despite the increase month-over-month, and year-over-year in reported apprehensions, the number of apprehensions still reflects lower figures than those reported by CBP over the paast decade. In FY 2008 CBP reported 723,825 total apprehensions, 556,041 apprehensions in FY 2009, 463,382 apprehensions in FY 2010, 340,252 apprehensions in FY 2011, 364,768 apprehensions in FY 2012, 420,789 apprehensions in FY 2013, 486,651 apprehensions in FY 2014, 337,117 apprehensions in FY 2015, 415,816 apprehensions in FY 2016, and 310,531 apprehensions last year in FY 2017, according to the CBP website. In the past 10 years, numbers have remained steady for the most part with more than 700,000 apprehensions in 2008 to more than 337,000 apprehensions in 2014. “DHS has significantly increased our referral rates to the Department of Justice for illegal border crossers when compared to the same time period in FY 2017. DHS and DOJ have taken recent steps to surge the necessary resources — such as asylum officers, immigration judges, prosecutors, and ICE attorneys — to promptly adjudicate cases through our civil immigration system or through criminal prosecution,” the DHS release states. U.S. Rep. Vicente Gonzalez, D-McAllen, last month criticized numbers released by DHS used to justify the deployment of Texas National Guard troops to the U.S.-Mexico border, saying those numbers don’t accurately reflect the reality of apprehensions taking place in the region. In early April, Gov. Greg Abbott deployed troops to the Rio Grande Valley, citing the DHS statistics that showed a more than 200-percent increase in illegal border crossings this March — with the same month in FY 2017. During his visit to the Valley, Abbott met with guardsmen and spoke to the media. Gonzalez said everyone is looking for solutions in the U.S. — but not looking at ways to create security, and more economic opportunities for citizens from the three countries in South and Central America – El Salvador, Honduras and Guatemala – who are coming over in large numbers.